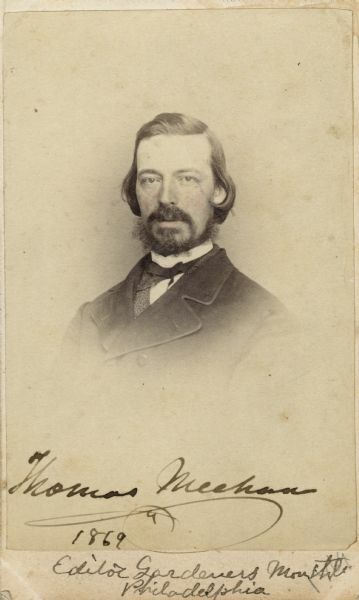 Vignetted carte-de-visite portrait of Thomas Meehan (1826-1902), American botanist. Meehan emigrated from England to Philadelphia in 1848. Served as editor to "The Gardener's Monthly" (1859-1888), and later his own "Meehans' Monthly" (1891-1902). The plant genus Meehania was named in his honor. Handwritten inscriptions at the bottom read, "Thomas Meehan, 1869," and "Editor Gardeners Monthly, Philadelphia." Photographer's credit on the back reads, "D. Hinkle, Photographer, Germantown." From album of portrait photographs collected by Lapham depicting scientists and artists, ca. 1860-ca. 1875. Images include portraits of geologists, botanists, sculptors, and authors.